Free Solo is a 2018 Documentary movie directed by . It stars Alex Honnold, Tommy Caldwell, Jimmy Chin, among others. 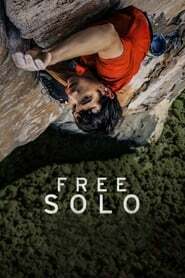 Free Solo is currently rated 8.0 stars on the ReelBugs scale. In theater this FALL. that is ominous. You know what's crazy? Everybody watching this knows that he makes it. He's fine. It's a success. The worry is over. Yet it's still impossible to watch and not be terrified. The most impressive wall on earth? You hear that Trump? I'm excited about how terrified I'll be while watching this. Probably the greatest physical feat of all time. We are thrilled that Free Solo has received the Oscar for Best Documentary Feature! Thank you to everyone for the support and for being inspired by Alex's journey as much as we were. Free Solo is airing this Sunday, March 3 at 9/8c. Watched it last night..I don't know anything about climbing, but I know this is one of the most beautiful, intense, engrossing and terrifying documentaries ever made. 1:51 can we just take a moment to acknowledge how open minded and beautiful his mother is for being able to support her son like that!!! All the sudden I am really motivated to do some pull ups. came here right after this won an oscar!!!!! Imagine after all that climbing the camera guy said "OOPS, forgot to press record..."
I climbed on my roof yesterday.....then I quickly climbed down, it was amazing. I almost dropped my phone because my palms are so sweaty from watching this. The most impressive sporting accomplishment in the history of our species. Just saw the movie. Never before have I watched on the big screen a human feat of this magnitude. This movie will have you on the edge of your seat. Thank you Alex for pushing the envelope. This movie will motivate thousands to do something amazing. This is great but can he do cliffs of dover on expert? this is potentially the limit of human existence. this is the strongest, bravest, most daring thing i think a human could ever accomplish, and that limit is both comforting and terrifying. Can't wait for this. This is indeed probably the greatest athletic achievement in history. If you tried to win Wimbledon starting today you would have a better chance than successfully completing this climb. It is astonishing and beautiful. I saw this last night. Thought it was fantastic. It was super interesting to see a portrait of Alex Honnold and his psyche, and the climbing scenes were so frightening and severe they were emotional and difficult to watch even knowing he made it. Wow. Congratulations to Alex and everyone involved with the film. And Alex, please don't try to top this. You've done it. You're the best. This really IS good enough.